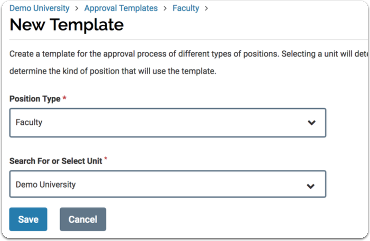 Our selection approval workflows feature is a practical tool to ensure that all academic hires follow an institution's policies about how to hire new faculty members. 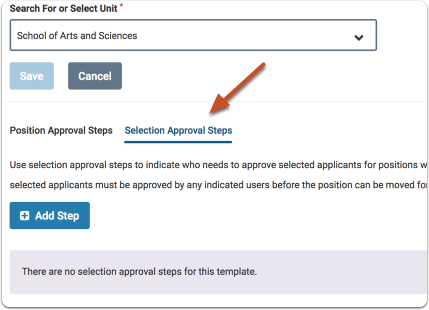 Administrators can set up templates that establish a series of approval steps which will take place after a search committee has selected one or more applicants to fill a position. At each step of the workflow, the proposed hire is approved and sent forward, or sent back by the approver at that step in the workflow. 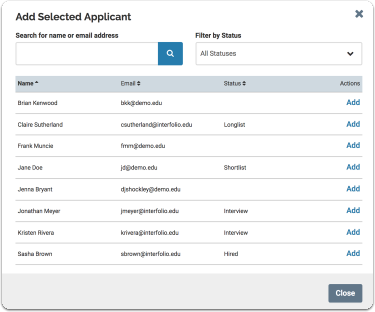 This feature provides our users with new insight into academic recruitment activities over time, and empowers organizations to enforce their own data recording policies. 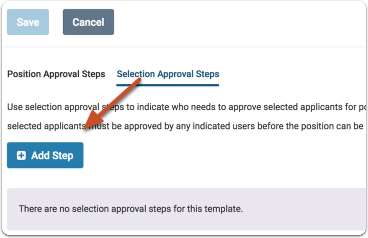 This article explains how to set up selection approval workflows to approve new hires. 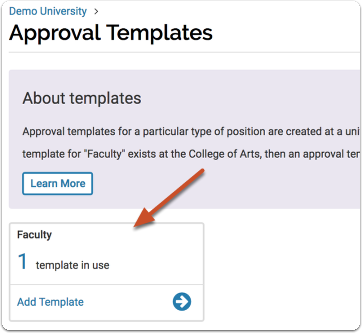 Both approval templates and selection templates are created and managed from the "Templates" page of Faculty Search. 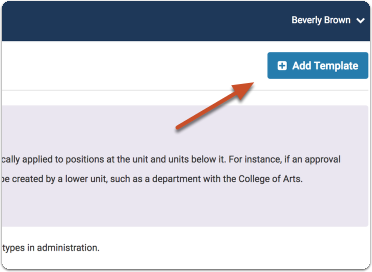 All selections of the indicated position type created by the given unit or units below it will need to go through the approval process you are establishing. 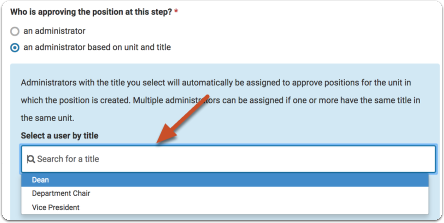 You can name one or more particular administrator(s), or indicate the title of the administrator who should approve selections for the chosen unit. 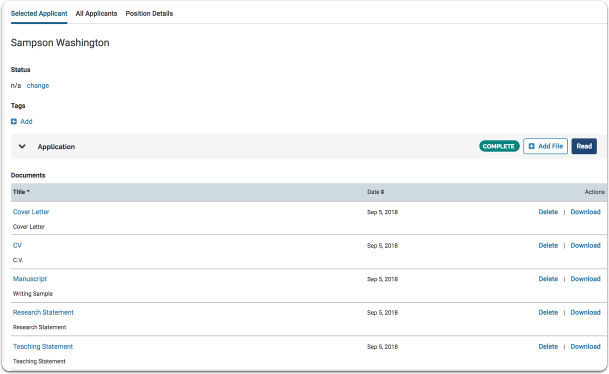 You can name particular administrator(s) who can approve hires for positions within their unit and below. 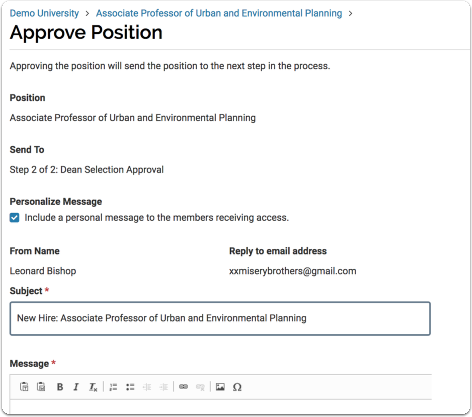 You can assign one or more administrators to each step to receive an email and action item to approve the position. 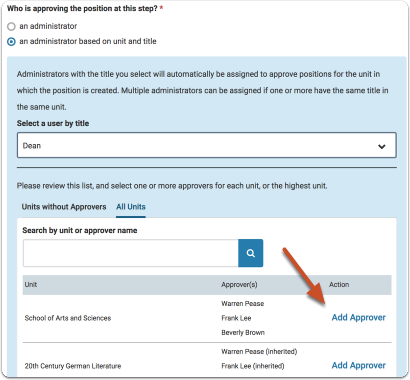 Search for and select an administrator to approve the selection, and click "Add User." 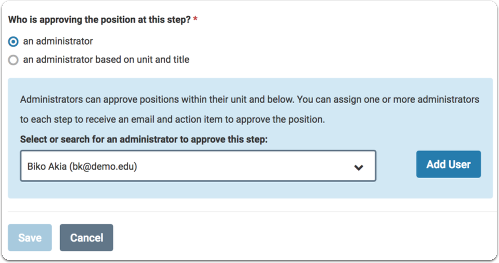 Administrators in the indicated unit who hold the title you select, will automatically be assigned to approve selections for the unit in which the selection is created. 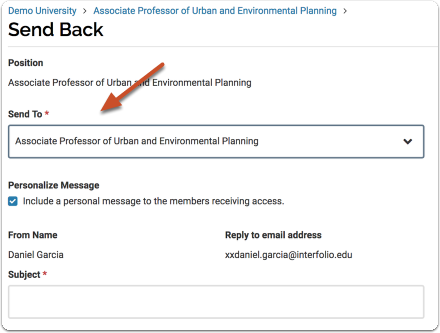 Multiple administrators can be assigned if one or more have the same title in the same unit. 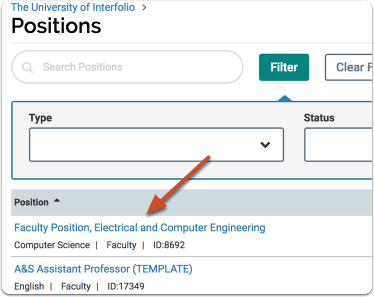 For more information on titles see this article on User Titles in Faculty Search. 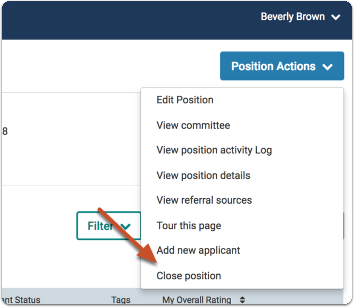 Search for and select the administrator, and click "Add Approver"
If selection approval is set up, this impacts the process of closing a position. 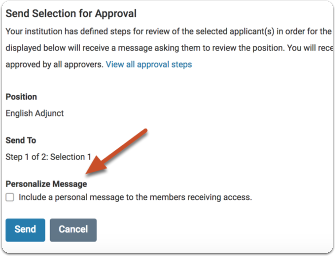 The instructions below explain how the committee manager or administrator can close a position and submit a selection for approval. 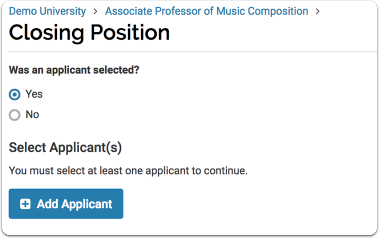 If one or more applicants was selected to fill the position, click "Add Applicant"
If you indicate a selection was made, you must select at least one applicant to continue. A list of available applicants will appear in a window. 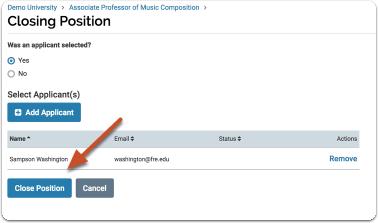 Find the name of the applicant(s) you want to select, and click "Add"
You can sort the list of applicants by name, email, and status, You can also search the list by name or email address, and filter the list by status. 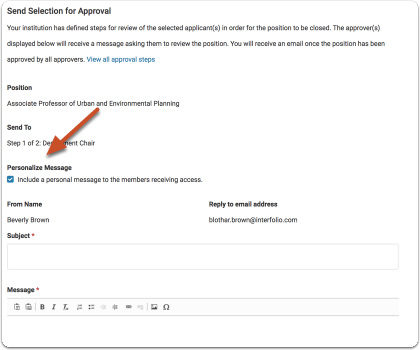 The approver(s) displayed will receive an email indicating that a selection has been made and is awaiting their approval. You can personalize this email with a message to the approver. The steps below describe the process of approving a selection. 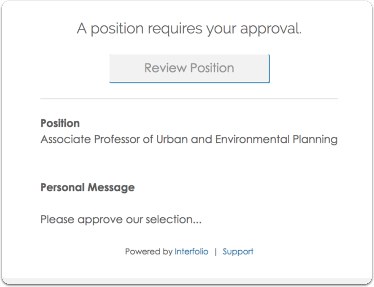 Indicated approvers will get an email like the one below notifying them that a position (selection) requires their approval. 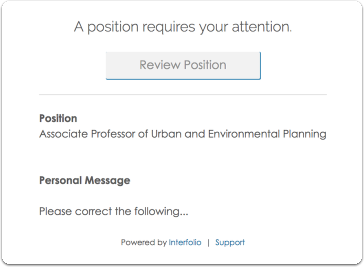 If a selection is not approved, click to send the position back to an earlier step. 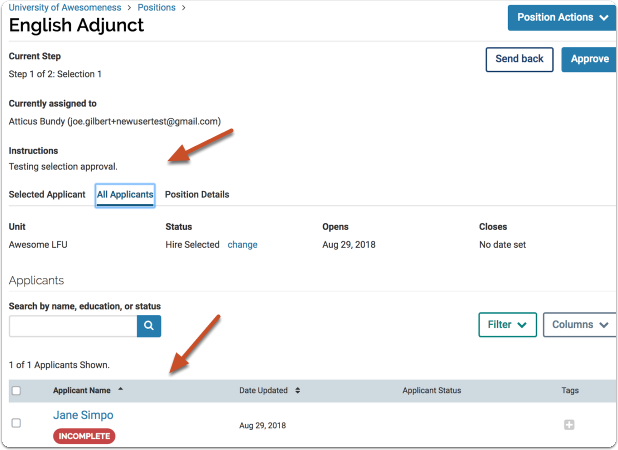 Note: With POSITION approval, you can send your position back to a previous step in the workflow and when it's resolved, it will return to the step that sent it back. 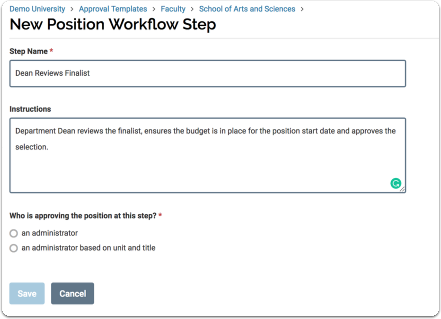 For SELECTION approval, when you send your position to a previous step in the workflow, it will need to go through all the steps in the built out workflow. For example, if your selection was sent from step 3 of the process to step 1, the selection will have to go back through steps 1, 2, and 3.